Typically found under cover of aquatic vegetation or other debris in the tributaries and swamps of coastal plain rivers. This species, like most rainbows, looks most at home in a planted aquarium. Provide areas of dense vegetation, along with some open areas for swimming. Water movement should be quite gentle. pH: An adaptable species in terms of pH. The values recorded across its native range vary between 5.6 and 7.4. Unless you know the collection locality it's probably best to aim for somewhere around neutral in the aquarium. Very peaceful, but can disturb smaller or slow-moving fish with its rapid movements and relatively large size. Good tankmates include other similarly-sized rainbowfish, characins, danios, barbs, freshwater gobies and catfish such as Corydoras. This rainbowfish can be quite skittish and does far better when kept in a shoal of at least 6-8, preferably more. The males will also be encouraged to display their best colours in the company of conspecifics. Obviously, a suitably-sized aquarium would be required for a very large group. As with other members of the genus, this is not a difficult species to breed, being an egg scatterer, although the fry can prove somewhat tricky to raise. The breeding aquarium should be at least 30″ long, and contain slightly hard, alkaline water with a pH of around 7.5 and a temperature of 80-84°F. A small air-powered filter will provide sufficient oxygenation and flow. The tank should be filled with fine-leaved plants such as java moss, or nylon spawning mops. No substrate is necessary. The adult fish are best conditioned in a group in a separate aquarium, with plenty of live and frozen foods. As the fish come into condition, the females will appear noticeably plumper, and males will display to each other almost constantly. Select the fattest, best-coloured pair for spawning and introduce them to the spawning tank. A small raise in temperature can often induce spawning. The pair will spawn for a period of several weeks, laying batches of eggs each day. These are attached to surfaces by a small thread. Although the adults tend not to eat the spawn, it’s easier to raise the fry in a separate aquarium, so we recommend checking the plants or mops regularly and removing any eggs you find to a raising tank containing water from the spawning tank. The eggs hatch in 7-12 days, depending on temperature, and the tiny fry initially require infusoria–type food, before graduating onto free swimming foods, such as brine shrimp nauplii, after a week or so. Sinking foods are unsuitable as the fry tend to stay very close to the water surface. There are currently 4 described subspecies of Melanotaenia splendida, of which this species is one of the most colourful. The principle differences are generally in colour, pattern and fin counts, although even these vary depending on the locality of the fish. The different forms and subspecies should not be mixed in the aquarium, as they may hybridise. 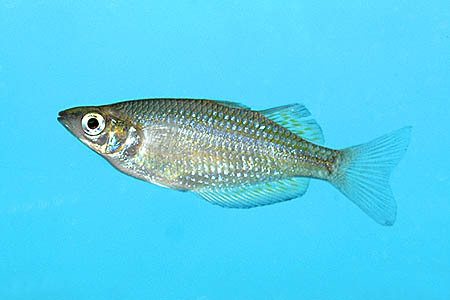 Adult specimens are rarely seen for sale, and it’s the much drabber juvenile fish that are almost always offered in dealers tanks. However, exercise some patience (even on a good diet, full colour development can take over 12 months), and you will be rewarded with a truly gorgeous adult fish.